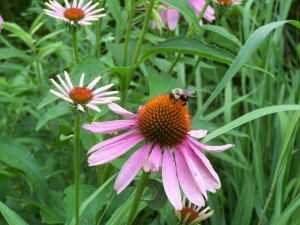 My Little Prairie Plot — Coneflowers, Bergamots, Queen-Anne’s Lace, Black-Eyed Susans, and many others. When one considers nature the dominant color is green. It is the floras of the world that provide the stage for the dramas of their more animate cousins. Unless you live on a polar ice cap or the remotest reaches of the desert the primary backdrop to all your activities consists of plants. Their presence is so ubiquitous that we generally do not even notice them. We take them for granted. Plants do not capture our attention easily. Until a tree falls on our house or poison ivy plays its cruel trick upon us we mostly see the world of plants as a green blur. They are not cuddly like puppies; they do not speak, bark, or purr. They are as indifferent to our existence as we to theirs. To us they are, as a group, Weeds. And yet without their activities we would perish. They feed us, clothe us, provide us with oxygen to breath, and lift our spirits with their brilliant flowers. So why weeds? A few years ago my daughter gave me something to think about on this topic. I was spraying musk thistles in the little pasture south of my house. This import from the old world has invaded our farm with a vengeance. 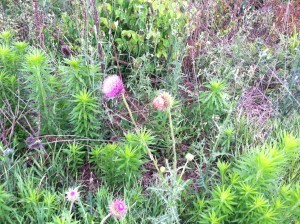 Like most thistles this one is characterized by spiny leaves. Unlike many other thistles the musk thistle also contains spiny bracts around the circumference of its purple flower head. It is truly a marvel of plant evolution; a fully armored plant. None molest the musk thistle without sustaining injury himself. Even if one succeeds in grasping the thistle with enough force to uproot it, it sacrifices part of itself for ultimate survival. Its long taproot inevitably breaks off, like a dandelion, at the surface of the soil. The plant withers and dies, but the taproot sends up another shoot and starts all over again. 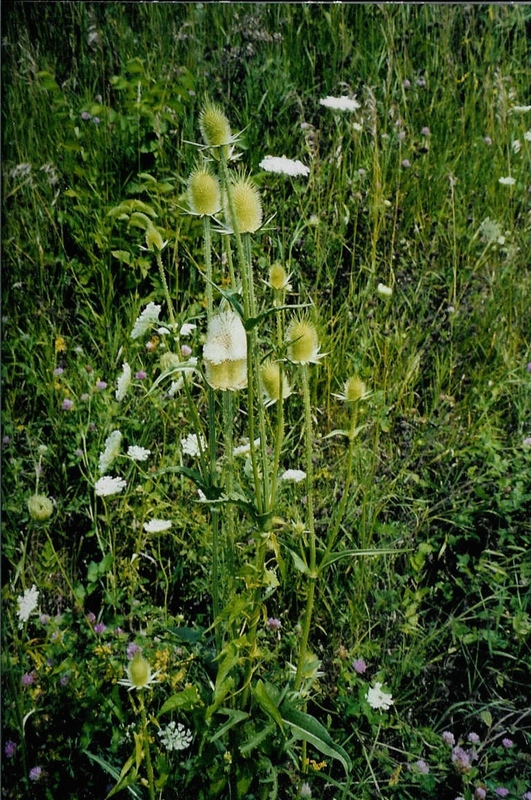 It is the thistle’s spiny defenses that make him unwelcome in the yard, and his tenacity that wear out his welcome in the garden. And though tenacity is a virtue in human beings we have little admiration for the obvious pinnacle of evolution represented by the thistle. My daughter made me “see” the thistle that day in the pasture as I was spraying them with Roundup. Thistle – Weed, right. Even though their seeds are valued by birds for food. Dandelion – Weed. Yet they are quite pretty . You can make wine from them or use their greens for salad. Jimson Weed – Even named Weed, must be a weed. 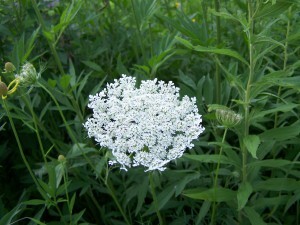 But few cultivated blooms rival the beautiful flower of this tough weed. Corn – Ha. Ha. That’s not a weed. But ask a farmer with a soybean field full of volunteer corn. Farmers spend millions of dollars a year to defeat the dastardly weed – Corn. So what are we to conclude. A weed is merely a plant growing where it is not wanted. There is no other difference. Chicory – A Weed, Right? My father once asked a nursery owner for chicory seeds. “Why that’s just a weed,” came back the quick reply. In a sense it is. 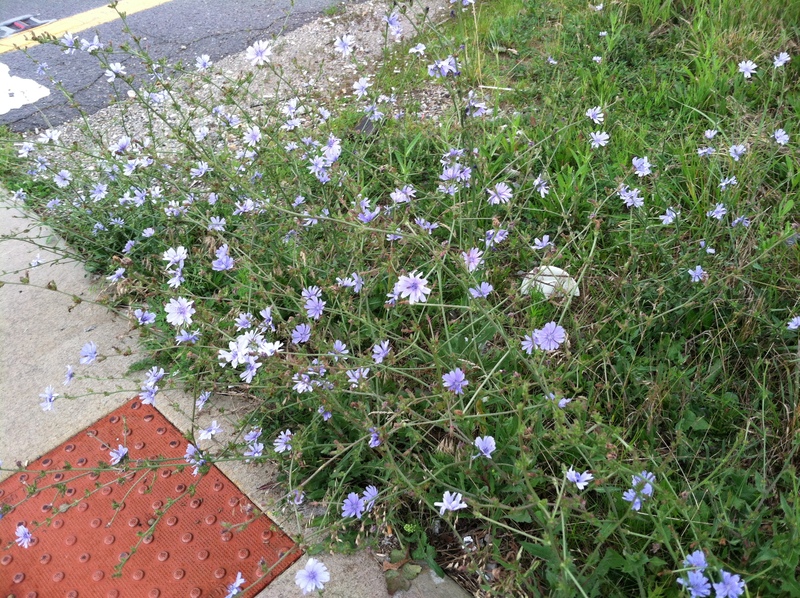 Chicory grows along most of the roads in our area. It is tenacious, pushing its way up though gravel beds that other plants cannot begin to breach. For a brief span in the Summer it seems that chicory is everywhere. Of course the plants are there for much longer. It is only when the brilliant cornflower blue blooms unfold that one takes notice of chicory. The way they light up the roadways at that time of the year you would think the Chamber of Commerce had hired a landscaper. But the chicory offers up this service for free, no contracts, no bids. It only requires the use of some unused space for a few weeks. Not a bad deal. If you don’t mind doing business with a weed. In my part of Rock Island County I have identified 5 patches of Compass Plant. These patches represent a few tiny islands in the vast sea of corn and beans that Illinois now represents. They are minute representations of what Illinois used to be. 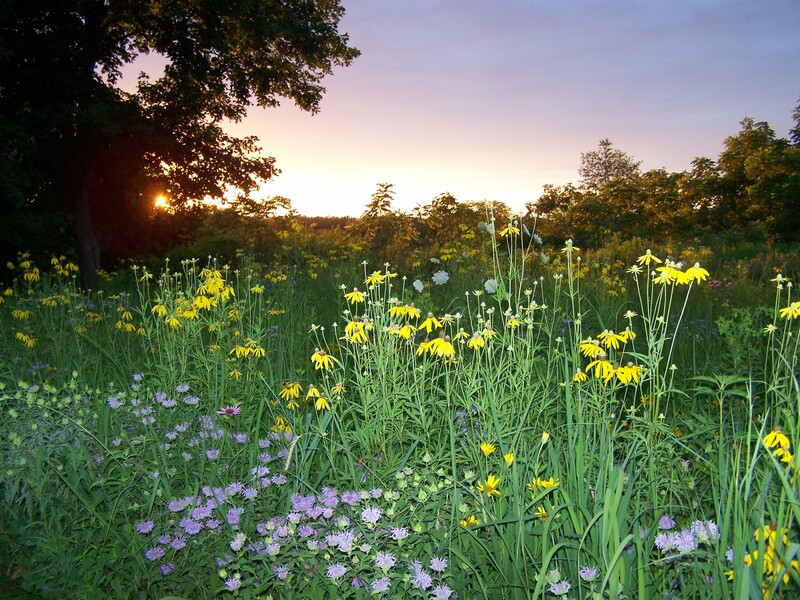 The vast rolling prairies which gave Illinois its nickname, “The Prairie State,” and its fertile soil are reduced now to these roadside refuges. They have not been spared on purpose. Their savior is the County road crew’s restrictive budget. 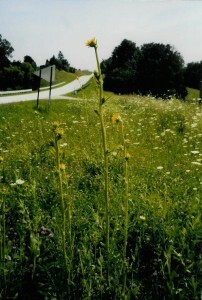 They can only afford to mow these roadsides once or twice a year. 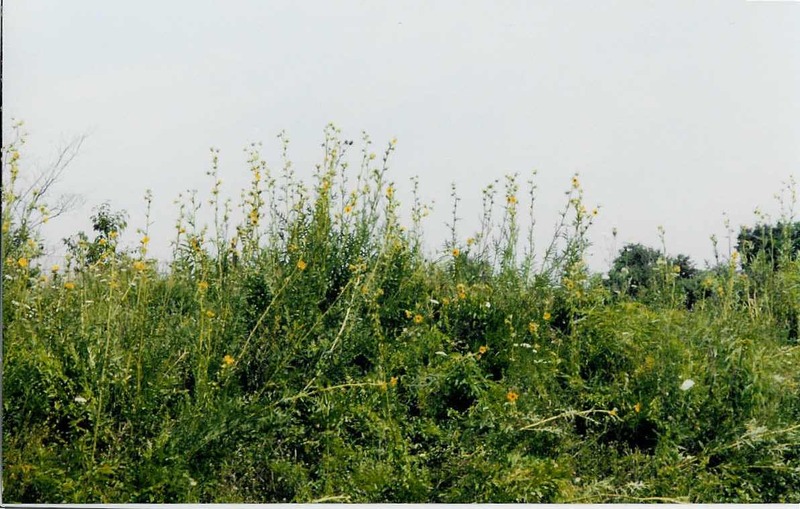 The compass plants spend two months building long notched leaves and finally, in mid July start growing a tall vertical flower stalk, sometimes 7 feet tall. On the top forms a series of pretty sunflower looking blooms. Then, just as they are forming their seeds the road crew or local farmers mow the road banks. The compass plants in the patches, along with the black eyed susans, wild bergamots, and teasels start over, pushing up a new crop of green leaves and finally, a less robust flower stalk. Smaller, and shorter, this new flower stalk sometimes sets new blooms about the time of the second mowing. In our area that is all the road crew can afford. It has not been enough to obliterate the tiny islands of prairie, but they are not getting any bigger. Since I have been watching them, about ten years, they seem to shrink a little each year. A couple of the patches eluded the mowers several times because they are on steep slopes. But about every other year they too get cropped by some diligent public servant who is justly proud of his skill, precariously edging the tractor up until it teeters on two wheels. Please don’t think I am disparaging these workers. Until a few years ago I didn’t see the compass plants, either, even though I drove past them hundreds of times. I didn’t see them because they were not a personality to me. They were part of the blurry green backdrop of my life; grass and weeds. They became real to me, individuated, because of a book I read by Mr. Aldo Leopold; A Sand County Almanac. 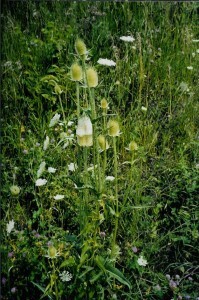 Since reading the chapter called A Prairie Birthday I have learned to see many different plants that were once just weeds to me. I have learned to know something of their habits. 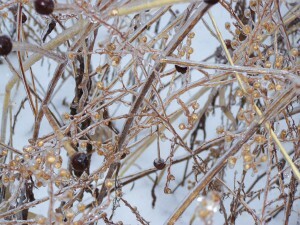 Part of our farm today is a nature preserve by virtue of its inconvenience. Ditches and wet patches and narrow necks of fields are too troublesome to farm, especially as machinery gets bigger and bigger for efficiency. Most wild areas remaining on Earth today are such. They have not been farmed over, grazed over, paved over, or drained only because it is too hard to do so at this time. Such areas will continue to shrink, as they have for generations. Inaccessibility is slowly overcome by technology and the economic feasibility of such development increases as more easily developed areas are exhausted. When I fly over America I see this slow, relentless process wherever I go. I notice it in North Carolina, a state once almost completely forested in the western parts. Now, as you fly into Raleigh or Greensboro you still see big expanses of trees but you also see unexpected “cutouts” throughout these forests where housing developers have bulldozed the “big trees”, built houses, then planted “little trees” in the yards. When you fly over West Virginia you are amazed by the endless, rolling mountains covered uniformly by dark green forest. I have sometimes said that if you could pound West Virginia out flat it would be as big as Alaska because there is not a flat spot in it. But I have to revise that a bit because when you fly over this amazing pristine maze of mountains and valleys today there are flat spots. There are barren, “dirty-looking” areas where entire mountaintops have been bulldozed down into the adjacent ravines. This is called, aptly enough, mountaintop-removal coal mining and from 37,000 feet it sticks out like a sore thumb in West Virginia. When you fly over what used to be the austere grandeur of the vast western plains of Kansas, Colorado, New Mexico, and Wyoming you are struck by how the landscape, even again from 37,000 feet, looks geometrical; man-made. And, as it turns out, it is. the terrain in western Kansas and eastern Colorado is now made up of vast circles; center pivot irrigation systems, dotted with hundreds of rectangular gravel pads; oil and gas wells. For now, midwest farms, and the southeast forest, and the hills of West Virginia, and the plains of Colorado are still a haven for the wild animals and plants that once made up all of America. Despite the necessity of feeding the human race, and lighting our homes, and fueling our cars and, yes airplanes, we still have space left for plants and animals and even beautiful vistas. We might think of these things, and value them, in the same way we do these other crops and commodities. We harvest from them a crop as valuable as corn or soybeans or coal or oil. These places have value because they lift our spirits, refresh our souls, connect us to the past, and renew our connection to the Earth. We harvest this crop not once in the Fall but continuously throughout four seasons. It is ours to harvest even though we did not plant it. It is not diminished no matter how often it is reaped. If you love the land, if protecting it is your goal, there are only two possible avenues to pursue. 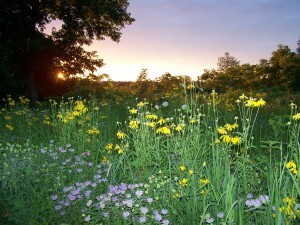 You can individually or collectively buy land and manage it for wildlife. The efforts of organizations like Ducks Unlimited and the Nature Conservancy are prime examples of the success of this approach. Such a process, is however, obviously limited. There is too much land and too few resources available for such efforts. The other choice is to teach people who own land to love it and respect it as we do. It need not be a hard sale. Most of the people, farmers and ranchers, who dislike environmentalists, don’t hate the environment. There is a reason farmers live in the country. There is a reason most of them would shrivel and die in the city. It is precisely because farmers love the land that they choose to be farmers and live on the land. And the farmers I know, like most people, will do what they can to protect the land if they know how. Each one of you will find nature to love and nature to nurture no matter where you live. The other day in the heart of St. Louis I stood beside a drainage ditch which had been built to receive wastewater from a parking lot. 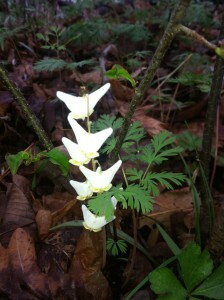 In the wide ditch I counted some 50 species of wild flowers, numerous trees, countless insects, 4 ducks, and a muskrat. How many people drive by this nature preserve every day? I do not know. But most of those people do not “see” it, even if they see it. The amazing variety of floras and faunas that make up our world are everywhere. If we notice them, and take notice of them, we go a long way toward insuring their continued survival. That includes weeds. Postscript: All these pictures were taken by me in and around a little native prairie plot that I planted about seven or eight years ago. It has been a great pleasure to watch it develop. For the first couple of years I saw mostly grasses (blue stems) and then some of the more robust forbs (black-eyed susans, coneflowers.) Finally, after a couple of years I saw compass plants growing in the plot. 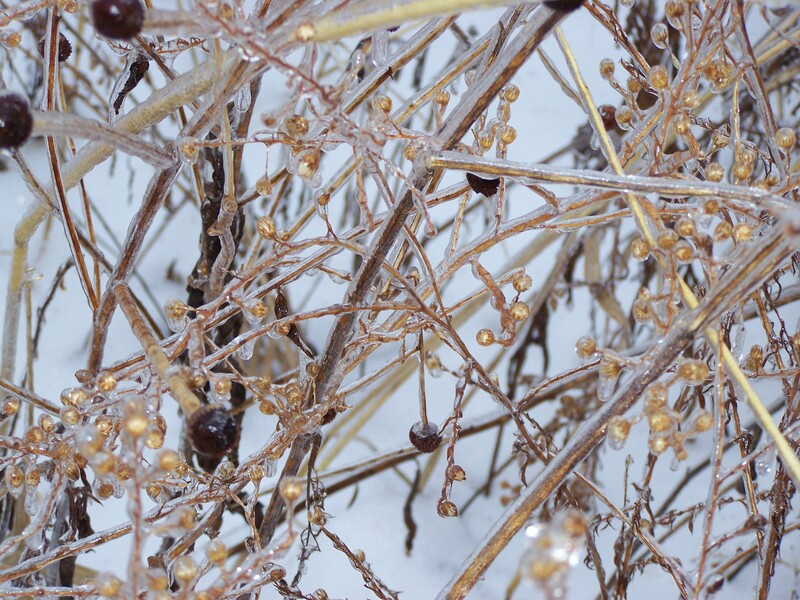 Their germination requires winter temperatures and abrasion (some prairie plants even require burning to benefit seed germination.) In what may seem a contradiction I have had to “weed” my plot from time to time to eliminate persistent and successful invaders like giant ragweed and musk thistle which threatened to “take over”. I am glad to say that as the plot has matured it has, on its own, eliminated the contradiction. I almost never have to weed anymore since the “native” plants now form an equilibrium that doesn’t exactly keep the invaders out but holds them to a level where they are simply another part of the community. 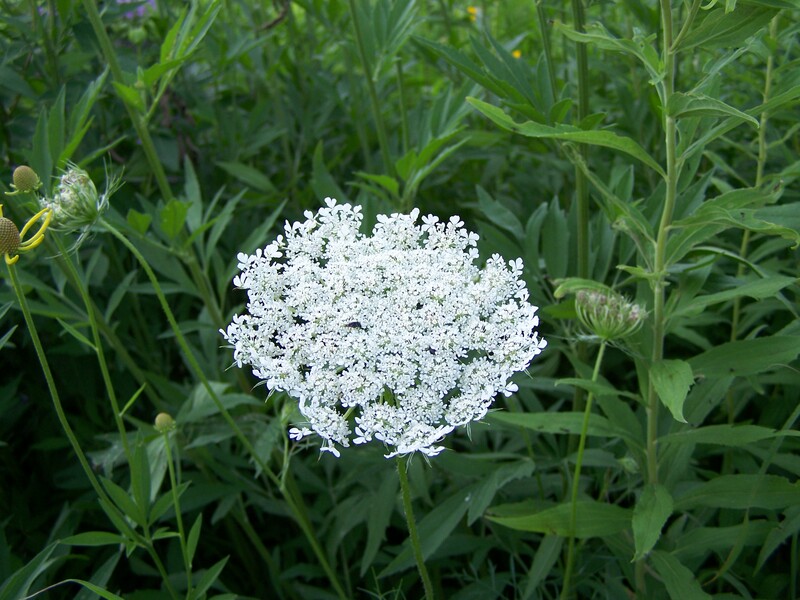 And I have decided to welcome some local “invaders” who are not strictly “native prairie” species simply because I like them (common milkweed and Queen Anne’s Lace.) This is what I mean when I say that everyone can find nature to love and nature to nurture in their own lives, be it a prairie restoration project or building a bat house to put in their yard.